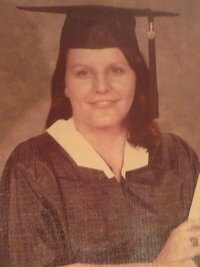 STATESBORO- DURDEN, Vicki Lynn Rowe Durden, age 56 entered into eternal rest on Monday December 9, 2013 at the Westwood Nursing Center after an extended illness. A native of Bulloch County she was born on October 17, 1956 to Emerson and Jeanette Bragg. She was a graduate of Jenkins County High School and Swainsboro Technical College. Vicki was employed with Bulloch Memorial Hospital and Ogechee Home Health, where she was a devoted and faithful CNA (Certified Nursing Assistant). She was preceded in death by her mother, Jeanette Bragg and her grandmother, Edna L. Johnson. She is survived by one son, Joshua Bryon Horton of Portal, GA; two daughters, Joy Leigh Horton and Karla Lyn Horton both of Statesboro, GA; four grandchildren, Patience Horton, Cohen Horton, Cheyenne Jackson and Harley Miles; her father, Emerson Bragg of Millen, GA; four sisters, Jo Davis of Statesboro, GA, Cindy Counts of Sylvania, GA, Lisa Taylor of Portal, GA, and Sharon Keelin of Statesboro, GA; as well as many nieces, newphews other relatives and friends. A Service of Remembrance, Commemorating the life of Ms. Durden will be held on Sunday December 15, 2013, 3:00 P.M. at the family's residence, 313 North Grady Street, Portal, GA. Private Graveside Service will follow.